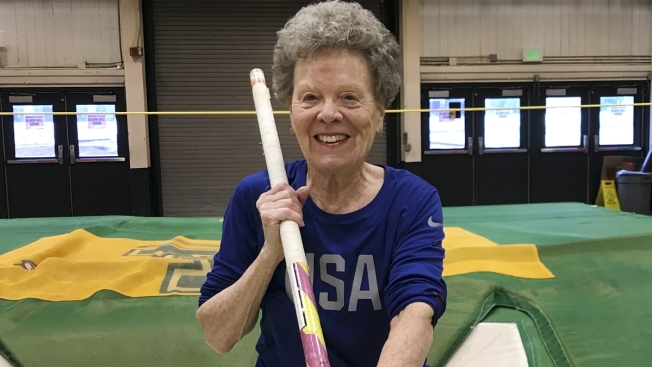 An 84-year-old pole vaulter isn't putting her pole down anytime soon. Meiler said she the events she likes the best are the hurdles and the pole vault — one of the more daring track and field events, in which competitors run while carrying a fiberglass or composite pole, brace it against the ground to launch themselves over a high bar, and land on a mat. Athletics has helped her though some hard times, she said. She and her husband adopted three children after losing two premature biological babies and a 3-year-old. Two years ago, their son died at age 51. Berg herself first started following Meiler 10 years ago while she was a student at New Hampshire's Dartmouth College, watching her at the annual Dartmouth Relays.